To my mind, kale is the rock star of all greens. I integrate it into at least one meal a day and sometimes it’s as easy as simply stuffing a handful of it into our morning green smoothies. Most times though I try and keep it intact in shape and form and celebrate its texture and flavor through both raw and cooked means. I think it’s important to incorporate an abundance of raw foods into our diets, along with the cooked, in order to provide the widest possible variety of nutrients so that we may not simply live but that we may thrive. Thoroughly combine all ingredients in a large bowl or plastic bag and marinate at room temperature for at least 4 hours, or overnight in the refrigerator. The longer it’s allowed to marinate, the softer the texture of the kale will be. Im guessing that this is a milder variety of kale you are using other than the one found in most supermkts. if not does the marinating soften the tougher variety of kale as well…i agree its a much misaligned green but tasty when prepared well. Yes, I used the Lacinato Kale which is also referred to as “dinosaur kale” and it has a flatter leaf and a softer texture. 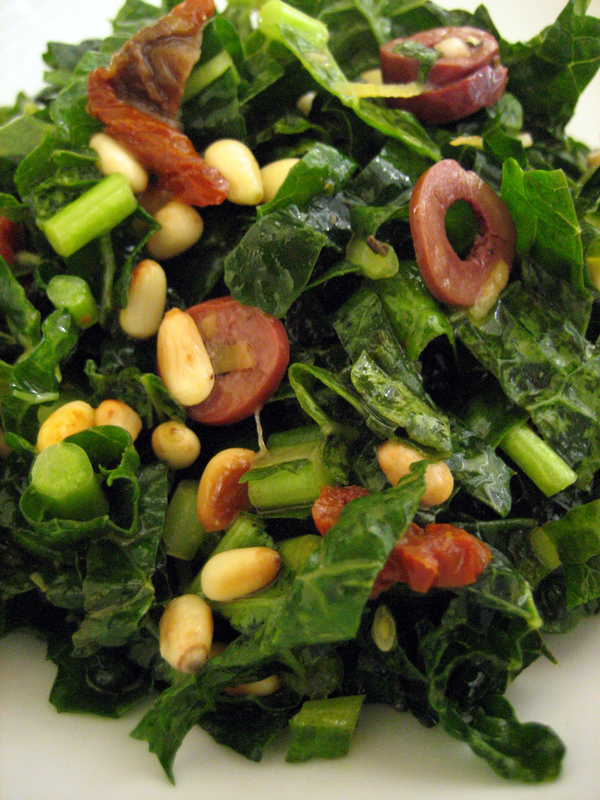 Any green will wilt under the influence of a vinaigrette, the heartier greens would simply take longer. I’d also help the process along by cutting the curly kale into very fine shreds to increase the surface area of marinade to leaf. I just made this last night and it was so delicious, many thanks! I really chopped up my kale since I could only let it sit for a couple of hours, and since my husband isn’t a big fan of pine nuts, I left them out. With summer tomatoes on the way, they will surely be finding their way into this too. Thank you for such a wonderful salad, super tasty and good, clean food! You’re very welcome and I’m glad that you adapted it to your needs and tastes! That’s what food should be about.